Handy set of matcha sticks with a slick double-wall glass shaker for making your matcha on the go. It’s perfect way of preparing your matcha during long office hours, while travelling or before workouts. 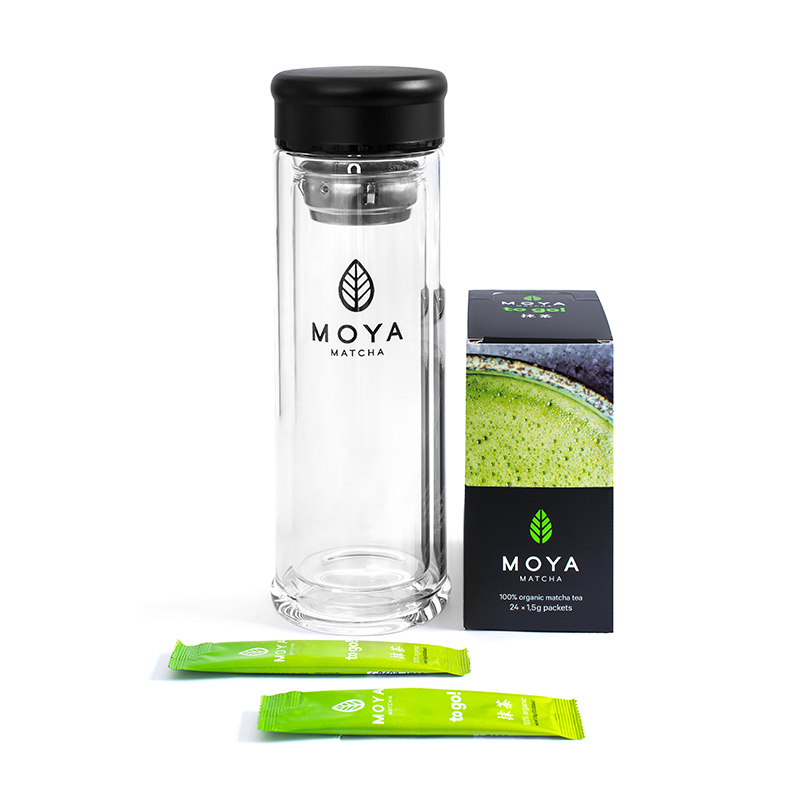 Each set contains a Moya Matcha Glass Shaker with Moya Matcha To Go! and comes in two versions: with 24 or 48 uni-dose sticks of matcha. 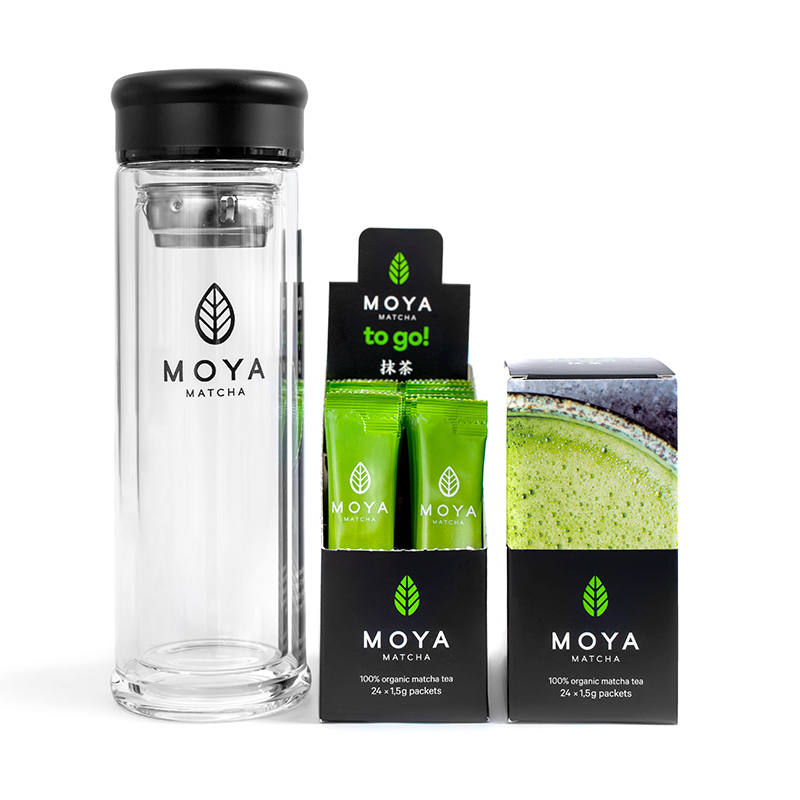 With Moya Matcha Glass Shaker you can prepare your matcha incredibly fast: just add matcha to your liquid of choice (water, juice or milk), shake & go ! It is a perfect travel & training companion and its double glass walls allow you to prepare matcha cold or hot. 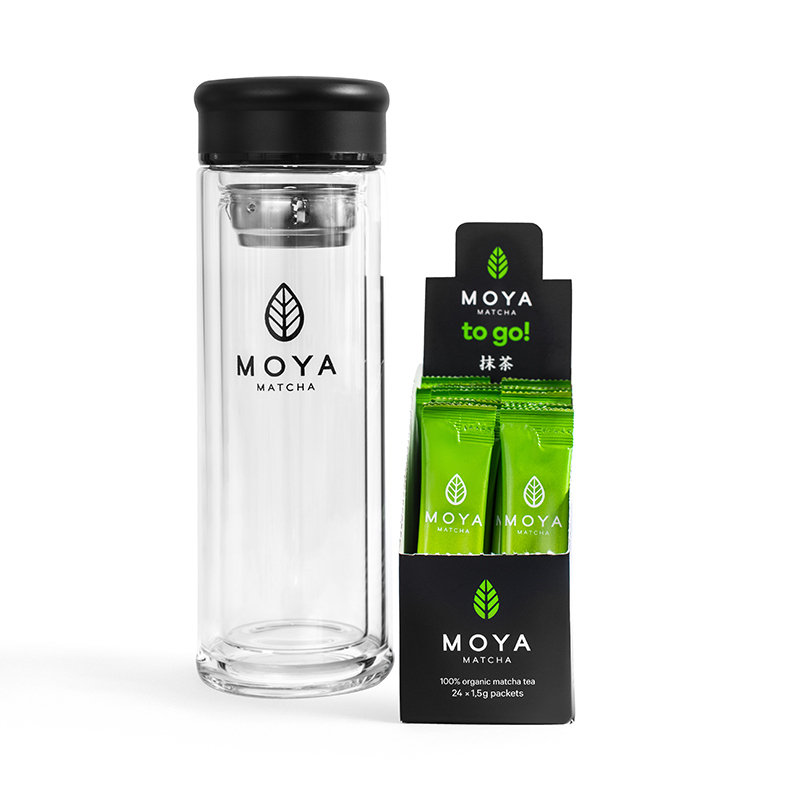 If you’re drinking matcha to boost your energy, speed up metabolism or help focus your mind on the task at hand: Glass Matcha Shaker allows you to do drink your matcha hassle free, anywhere at anytime. Lid: Stainless steel with silicone seal. Moya Matcha Traditional is obtained in the 1st and 2nd harvest from tea plants that are specially shaded from direct sunlight. This results in higher chlorophyll and L-Theanine contents and a richer, greener color. The fresh leaves are then collected, dried and ground to powder. Moya Matcha Traditional has a balanced rich bitter-sweet taste, creamy texture and malachite green colour. Its full-bodied flavour makes it ideal to drink on its own but also in lattes, smoothies and lemonades. It can be prepared traditionally in a matcha bowl (matchawan) or in a glass shaker.